Scottish Dance Theatre (SDT) is Scotland’s national contemporary dance company and is part of Dundee Rep Theatre. 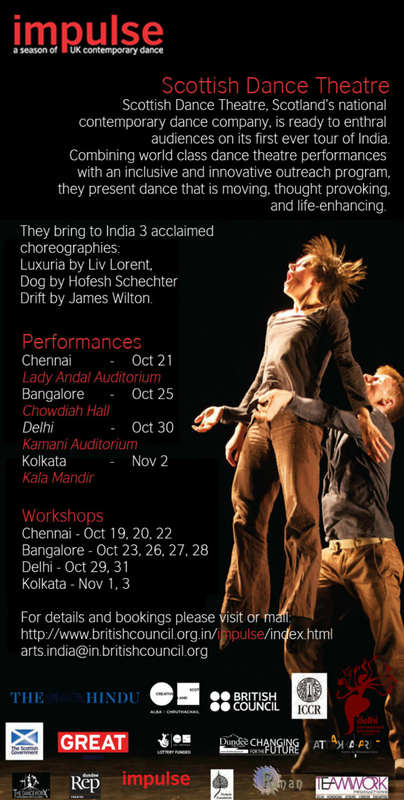 SDT’s programme includes work by internationally celebrated and emerging choreographers. The repertoire is constantly evolving, pushing boundaries and expectations. The company has 9 dancers and 2 apprentice dancers and tours throughout the UK and internationally, with recent performances in China, The Netherlands, Italy, Denmark and the USA. Lecture Demonstration (30-45 minutes) A short introduction to the work of SDT, prior to the creative workshops. A guided viewing of some of SDT’s work on DVD, followed by a Q&A session. Advocating the strong creative and collaborative approach embedded in the culture of SDT, the resource persons will lead creative workshops which prepare the mind and body, and encourage a playful approach to participants exploring their own movement. Working on composition and choreographic skills, students will create dances in response to tasks, themes and movement ideas drawn from the SDT repertoire. Students will also engage in discussion and evaluation sessions to enable constructive feedback on their work.